system that permits blood to circulate and transport nutrients (such as amino acids and electrolytes), oxygen, carbon dioxide, hormones, and blood cells to and from the cells in the body to provide nourishment and help in fighting diseases, stabilize temperature and pH, and maintain homeostasis. The study of the blood flow is called hemodynamics. 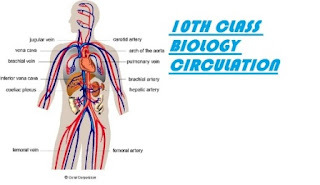 The study of the properties of the blood flow is called hemorheology.The circulatory system is often seen to comprise two separate systems: the cardiovascular system, which distributes blood, and the lymphatic system, which circulates lymph.The passage of lymph for example takes much longer than that of blood.Blood is a fluid consisting of plasma, red blood cells, white blood cells, and platelets that is circulated by the heart through the vertebrate vascular system, carrying oxygen and nutrients to and waste materials away from all body tissues. Lymph is essentially recycled excess blood plasma after it has been filtered from the interstitial fluid (between cells) and returned to the lymphatic system. The cardiovascular (from Latin words meaning "heart" and "vessel") system comprises the blood, heart, and blood vessels.The lymph, lymph nodes,and lymph vessels form the lymphatic system, which returns filtered blood plasma from the interstitial fluid (between cells) as lymph. diploblastic animal phyla lack circulatory systems.